At first glance Greg Merson doesn’t look like the typical poker player sponsors are coveting these days; he’s not an attractive woman or a former athlete; he doesn’t have a bigger than life personality nor is he an outspoken user of social media. But what sponsors reaped by betting on Greg Merson before the World Series of Poker Main Event was far more than anything they could have sown anywhere else. Merson may not be the prototypical sponsored pro, but the 24 year-old from Maryland may redefine what sponsors look for after his memorable WSOP Main Event performance, as I’ll soon explain. Two such sponsors were IveyPoker.com, the newly launched online training/social media poker site headed by the one and only Phil Ivey, as well as Boston-based DraftKings.com, a fantasy sports website, who sponsored Merson just days before the main event final table recommenced. Sure there were better stories, and safer bets, at the final table than a soft-spoken recovering addict who anonymously grinds online cash-games, but Merson seems like the type of guy that’s easy to root for. Just watching him at the final table I would bet that anyone meeting with Merson in person would just have that “feeling” that this was the right guy. First, Merson has his demons, but he owns up to them, and doesn’t sugarcoat the struggles he lives with everyday to keep his addictions in check; something that all of us can relate to on some level. His story of real-world (not poker-world) trials and tribulations is fascinating on so many levels, and just makes people want to root for him. Second, Merson is also the first player I can recall since Jerry Yang who wore his emotions so openly on his sleeve after his WSOP victory, shedding tears in the post-tournament interview, with his proud parents right there by his side. Usually we get people who realize the gravity of the moment, and their new place in poker going forward, but for Merson it truly seemed the moment was about beating the past and being a WSOP Champion is just one small part of Greg’s persona from here on out. Finally, Merson is well-respected by his peers, and as Antonio Esfandiari basically said on the telecast, Merson is All-Aces as a person. Of all the WSOP Champions in the modern era I feel Merson has the best chance for continued success because he doesn’t seem to be “just another young poker pro” his life is far more complicated than just poker and he seems to have worldliness beyond his 24-years. 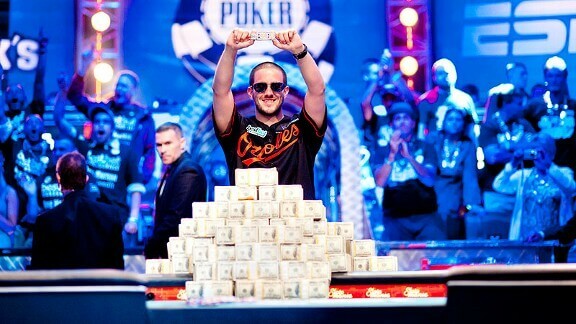 Hopefully Greg continues to thrive and continues his excellent run which includes being the WSOP Main Event Champion, the 2012 WSOP Player of the Year, a two-time bracelet winner, and some $10 million in tournament winnings for 2012.